Turmeric is a staple ingredient in my kitchen cabinet for many reasons. First of all, its unique taste and vibrant colour brings any dish to life. Besides this it also has numerous health benefits while ingested, and used externally. It’s highly anti-inflammatory, antioxidant and detoxifying. For me, a turmeric latte is a life-saver whenever I feel like my body needs a little kick in the immune system. Plus it’s freaking delicious, I like to use a blend by Viridian that has cinnamon, chilli, vanilla and cardamom. I recently discovered the benefits of turmeric for the skin, when used externally. 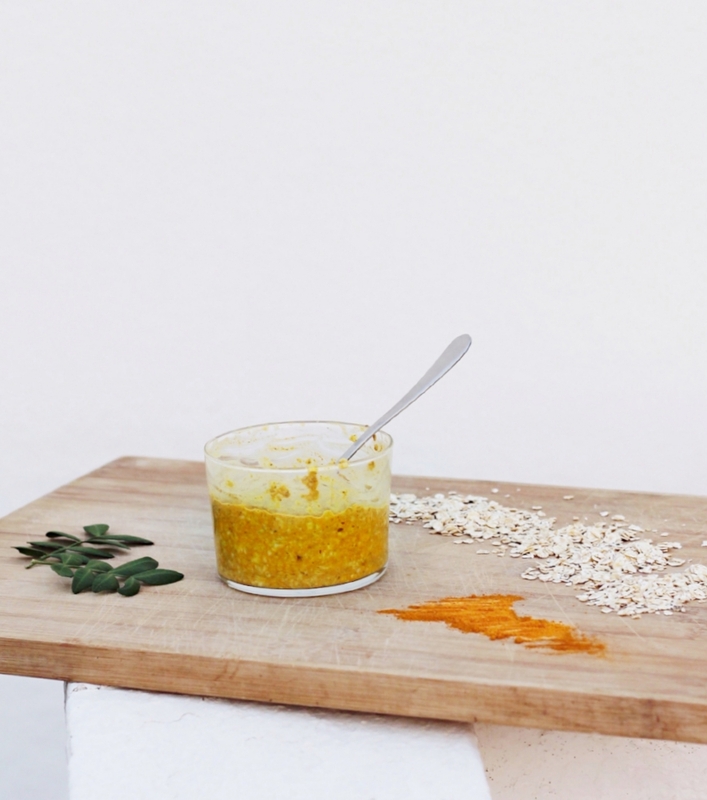 Turmeric can help slow down cell damage and it evens out any colour pigmentations. Combined with the soothing and anti-inflammatory qualities of oats, it’s a perfect match for anyone who suffers from skin conditions such as acne, eczema or dry skin. I used this while traveling for my sunburned face, and it worked like a charm. -Stay protected! and enough water to reach a desired consistency. Ps. Don’t sleep on a white pillowcase after this mask like I did. I'm drinking the foamy matcha latte at my local coffee shop. The foam fills my desires and all my senses are on fire. I can feel how my cells are loving the cup of magic. I walk home through the snowy streets. I strip the layers of clothing on me and wrap my morning robe on. I put my hair up and spalsh water on my face. I paint my face with the cup of magic. I can smell the matcha latte on my face. I can feel how she renews my skin, renews me. Mix all the ingredients together and brush it on your face, neck and chest. Let it sit until it's dried or up to an hour. Wash it off and massage a natural moisturiser on your face, neck and chest. Aloe vera, or as the Egyptians called it ''the plant of immortality'', is known for its soothing and healing properties. Aloe vera contains hormones called Auxin and Gibberellins, which provide both anti-inflammatory and wound-healing properties. It’s also packed with vitamins and minerals, and the list of health benefits seem to be endless. My skin always feels instantly refreshed and smooth after using this mask. I love the acidity from the lemon as it’s very cleansing, and combined with the soothing properties of aloe vera it's the perfect blend. I simply blended the aloe jelly from 3 aloe leaves with the juice of one lemon in a blender. This mixture should last in the fridge for a week, so you don't have to use it all in one go. I was lucky enough to do this while I stayed in Menorca, where Aloe Vera grows naturally, and lemon trees are found in every backyard. However if your surroundings are more like ours in Finland and Aloe Vera doesn't grow wild out there, you can also use an aloe vera room plant. just make sure it’s the right species for skincare! Take care of your plant and you'll soon have an endless supply of Aloe Vera jelly. Sounds pretty good, huh?